No great fairy tale ends happily ever after without the perfect pair of shoes — just don’t expect to find Kate Middleton teetering around in glass slippers. It is reported that thoroughly modern Middleton will be sporting flats under her wedding gown instead of a traditional high heel. Consider flats frumpy? Think again. Thanks to crystal embellishments and finely crafted leathers, today’s options can be just as elegant as a pair of serious stilettos. If you’ve shunned the idea of going heel-free, it may be time to reconsider. It is rumored that one of Kate Middleton’s four footwear changes will include a pair of silk covered, highly embroidered slippers — a move that will likely refashion flats from frumpy to fabulous. Think about it. You won’t exactly be able to break in a pair of towering heels before the big day, and who even sees your shoes under the gown, anyways? The latest styles available prove that brides no longer have to sacrifice style when they dial down on height. From beautiful ballet flats to inventive oxfords, we’ve rounded up four perfect pairs that are total fashion do’s when you say “I do”. 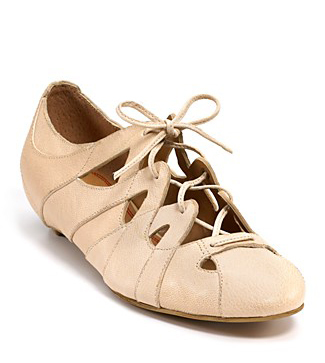 Leather covered rhinestones give these basic cream colored ballet flats an elegant edge. WE love that this pair features a padded foot bed – perfect for late night dancing. These wrap stars prove that functional footwear can still be fun. 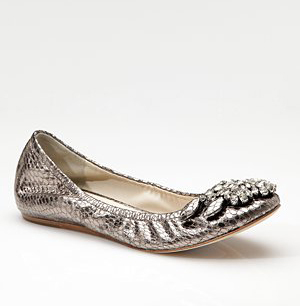 Snakeskin surprises while the peep toe is totally flirtatious. We dare you to wear these shoes from reception to plane – they’re the perfect go-with-anything honeymoon sandal. Not a ballet slipper type of bride? Borrow from the boys with a great oxford. Flirty cut outs and a lace-up front help to feminize this style. Almond piping and sweet lace are utterly romantic, even in a more masculine style. 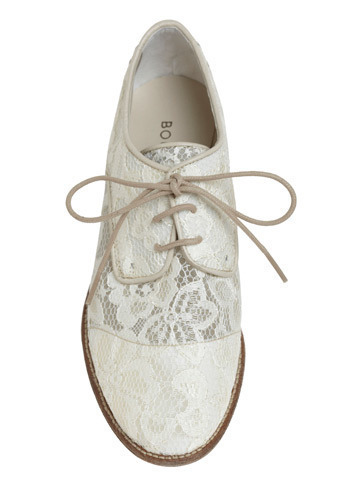 These lace-ups toe the line between tomboy and sweetheart.